Minneapolis, MN (March 11, 2015) – While the numerous benefits of probiotics – “good” bacteria that naturally live in the gut and benefit the digestive and immune systems – are well established, there has yet to be a supplement with the optimal strains and dosage for endurance athletes. 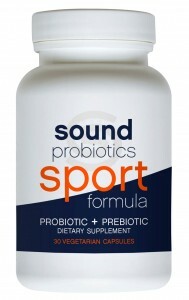 Enter Sound Probiotics: scientifically formulated to meet the specific rigors of the endurance athlete. Sound’s eight carefully selected probiotic strains target the unique needs of those who train and/or race regularly, pushing their bodies to the physical limits, thereby increasing the risk of GI tract issues and upper respiratory illness. Plus they’ve also included Beta-Glucan, a critical “prebiotic,” to the mix, which works as a catalyst with the other strains, increasing their effectiveness, while adding its own natural health benefits. But how does something aid at digestive tract wellness aid in upper respiratory infections? About 70% of the immune system is actually located in the digestive track. A simple explanation: When you exert great physical effort, blood is diverted from your gut and toxins “leak” in to the bloodstream, weakening the immune system and increasing inflammation. Among other things, probiotics provide a barrier so fewer toxins can leak through.